Posted On March 23, 2019 by Team iCynosure. Beauty, means different things to different people, in varying degrees of acceptance and rejection. Unfortunately, we take the phrase ‘Beauty lies in the eyes of the beholder’ very seriously and strive to match up to expectations of what the world would consider as ‘Beauty’, that it has lead to become superficial to the point of ugly and to the extent of losing one’s authentic self. The conversations today are aimed at making appearances a priority with a focus on the physical realm. The so-called beauty methods and procedures are advancing so rapidly that it not only is difficult to adapt but also very expensive. In reality, by the time you have been pinched, tucked and enhanced, you have lost yourself to the notion of beauty, rather than beauty itself. The imperative question we must all ask ourselves is whether we want to continue spending money to achieve beauty that is about looking beautiful from outside-in or introspect and aim to achieve beauty from within? The answer to that important question, especially for me is to maintain the quality and beauty of the being. And when that happens, my beauty will glow and it will draw in everyone like a moth to a flame. I have worked in the wellness and healthcare industry, and thus discovered some secrets that have helped me understand beauty and strive to feel and look beautiful. A smile is one of the most important features of inner beauty, that can touch every heart. It is a positive affirmation that benefits the health as well as overall wellbeing of a person. So go on smile as much as you can, in fact, laugh and scream with joy. Eating a healthy, balanced diet with emphasis on whole foods and vegetables and fruits help you achieve a glow that no cosmetics can attain. Nourish your body with food that helps it grow, remain healthy and add to your overall wellbeing. Add seasonal fruits, multigrain flour, raw as well as boiled vegetables for natural enhancement. The body needs to work as much as the mind and the heart, so the simplest way to achieve that would be to exercise at least 30 minutes every day. However just do not exercise with your body, involve your soul, walk in a beautiful garden taking in the beauty of nature, spend some time with yourself while doing yoga to calm your mind, pick your favourite song to dance the blues way or jump into the lap of water to swim away. The two pillars of beauty are anti-ageing and skin glow, which is a direct result of the amount of Glutathione and Vitamin C in the body. Glutathione, a master anti-oxidant, produced by the natural mechanism in the human body, is a combination of proteins elements such as cysteine, glycine, and glutamine. It helps to delay ageing, supports skin brightening and improves skin tone and skin buster. However, Glutathione requires Vitamin C to improve absorption in the body, with an added benefit of collagen synthesis in the skin. Due to multiple factors like lifestyle, dietary habits and also age, the levels of Glutathione and Vitamin C in the body needs to be replenished. 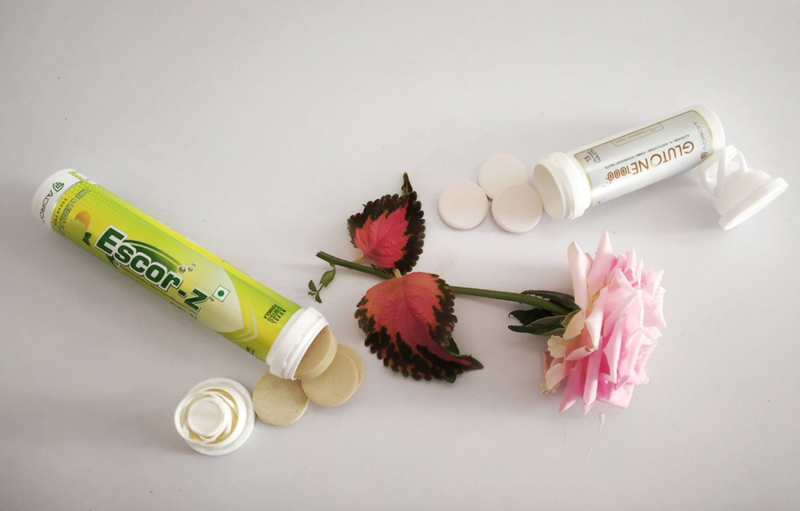 A brand that has made great inroads into these natural ingredients is ClickOnCare that offers Glutone 1000 and Escor Z.
Glutone 1000, which contains the world’s best Glutathione - ‘SETRIA Glutathione’ is critical for the optimum health of every body cell. It is the master anti-oxidant and works towards immune function, detoxification, and skin health. The main ingredients of Glutone 1000 are L-Glutathione that improves skin tone and enables skin lightening, Vitamin C that helps collagen synthesis and increases intracellular stores of Glutathione, and N-Acetycysteine that improves the body’s Glutathione Levels while reducing the free radicals. The main use of Glutone is to reduce photo ageing, uneven skin tone and skin dullness. The most important benefit of Glutone among many others is replenishing glutathione stores in the body for enhanced anti-ageing and skin lightening. Escor Z which contains Phyllanthus Embelica extracts that is a rich source of Vitamin C, enables the body to fight free radicals, boost collagen and lighten the skin. The main benefits of Escor Z include skin lightening by reducing the melanin pigment, increase production and transfer of anti ageing protein and exert photo-protective effects by neutralising free radicals. When both these supplements are taken together, they form a power-house for skin health and the results are spectacular. As these natural products work from within the body, they are a silent tool to improve skin tone and texture, boost collagen and reduce melanin pigments in each and every skin cell. Thus the effect is on the overall body and not just a particular part with visible signs of skin lightening, skin brightness and less pigmentation. With these simple steps, you can enhance your skin health with an inside-out approach and ensure your beauty shines from within.